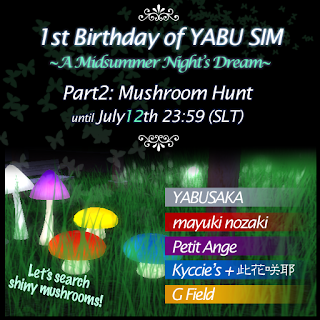 *G Field*: YABU SIM 1st Birthday Hunt! Hello! Our SIM's B-Day party is not over yet! Look for shiny yellow mushrooms. Don't forget to look for other shop's mushroom too! There are lot of fabulous gifts! so don't forget to pick up your gifts from “RAINBOW BEACH BALLS” too!